Cloth transformed by adding or subtracting color, line, shape, texture, value, or fiber to create a compelling surface. That's an intentionally broad definition. All of the cloth that I create fits some or many aspects of this definition. 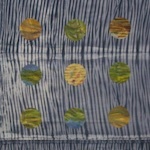 In this part of my portfolio you'll find work that is cloth meant to be displayed flat, against a well. Although many pieces incorporate piecing or stitching, these works are generally not quilted.